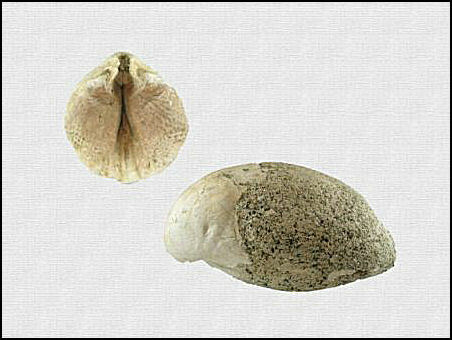 Oleneothyris harlani is a large brachiopod from the Paleocene Epoch averaging about 2 inches in length. These shells are found in abundant in what is known as the Oleneothyris biostrome, a well-known stratigraphic marker at the top of the Hornerstown Formation. 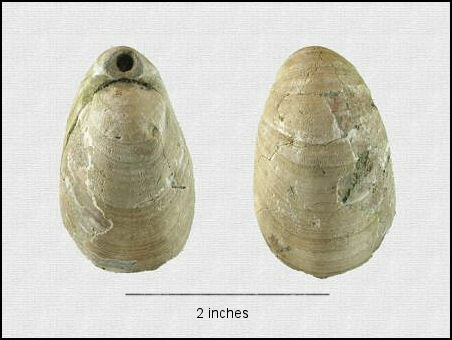 One of the few brachiopods found in New Jersey, Oleneothyris harlani has a distinctive elongated-oval body with an incurved beak that flattens. There is an obvious opening at the end of the beak. Brachiopods, or “lamp shells”, are actually made up of two different halves, or valves, the pedicle valve and the brachial valve. When viewed from the side the brachiopod is not symmetrical. Note: A second species, Oleneothyris fragilis is know from only one location and is currently beyond the scope of this website. 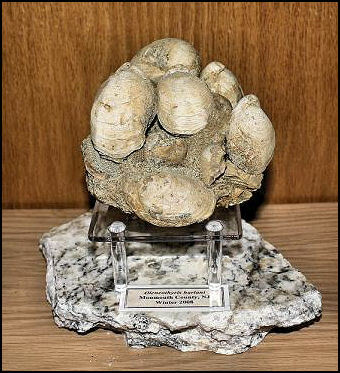 A large brachiopod, often measuring over 2 inches in length. The incurved beak is a distinguishing characteristic. Left - Internal view - Right - Partial internal cast. Stream wear will quickly erode most of the natural shell. internal casts allowing a peak at the inside. A cluster of the brachiopod Oleneothyris harlani.